On 1st February 1793, Revolutionary France declared war on Great Britain and the Netherlands, launching an invasion of the latter fifteen days later. With astonishing rapidity Britain sent an expeditionary force to the aid of its ally, which set sail from Greenwich later the same month. The following year, the 28th Regiment set sail from England with more substantial reinforcements to join the Duke of York in Flanders, and by August the Royal Duke’s army was over 34,000 strong. The 28th were to remain in Flanders for a year, in a campaign marked by dismal weather, logistical breakdowns, and ill-conceived and executed plans undertaken by the British and their Austrian and Dutch allies. Fortunately, inadequate Allied strategy was saved from disaster by the professionalism of their soldiers and the even greater inefficiency of the French Revolutionary army at this time. Two officers of the 28th were later to achieve greater fame in the wars against the armies of Napoleon in Spain and at Waterloo. Lieutenant-Colonel Edward Paget would lead the regiment in Egypt and become a general under both Moore’s and Wellington’s commands, while Captain Hussey Vivian would later be a successful cavalry commander. And the Duke of York himself, although never to be marked out as a brilliant commander in the field, did a great deal to reform the army which was to be Wellington’s instrument of victory. Vivian recorded his experiences in his letters home. One action, fought on 10th January 1795 by Lord Cathcart’s Brigade of the 14th, 27th and 28th Regiments nearly ended in disaster. “Before we got half way to Buern we heard a very smart firing, which was occasioned by the French making an attack on our outposts. “The 27th and 14th regiments were ordered immediately to their support, and we were directed to follow as quickly as possible in case the enemy’s force should be too great for them. “The two regiments no sooner saw the enemy than they charged bayonets and drove them to the village of Geldermalsen, with trifling loss; and so elated were they at their success that they (as was the case at Toulon) rushed impetuously through the village, and were checked only by a body of 4000 of the enemy. “It was now they that were obliged to retreat, and I am sorry to say with considerable loss, both of officers and men. “Lord Cathcart, who commanded, immediately sent off an express to us, saying if we did not run for it the two regiments were lost; and luckily for them we arrived just in the nick of time, so that we formed on one side of the Rhine and Lingen, under an immensely heavy fire from the enemy, whilst the two regiments retired over the ice from the village. “… During the whole of this time our regiment was sustaining their fire, ourselves not firing a shot; and I am sorry to add, with great loss. From my own company, in less than ten minutes, I lost nine men wounded severely, besides numbers hit with spent balls; amongst the former was a wonderfully fine lad, my servant, who, although shot in two places through the arm, would never quit me. He is, I am happy to say, out of danger; and you may depend I’ll spare no pains to get him well as soon as possible. “During this business, which did not last a quarter of an hour, our regiment lost two sergeants and sixty-five privates wounded; and what is more astonishing, out of twenty-one officers not one was touched; in fact our regiment was always lucky in this respect. I am sorry to add out of our wounded men many are dead, and the surgeon says that two-thirds will either die or be unfit to serve again. Out of my nine I shall lose but two. I forgot to mention that this loss was only from nine companies, the grenadier company not being engaged. By the 19th of January 1795, the Duke of York’s army had been reduced from 34,000 men to less than 7000, and the 28th Foot from 403 rank and file to 157. 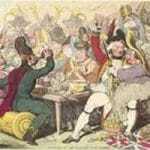 Picture: “Fatigues of the Campaign in Flanders” by Thomas Gillray.